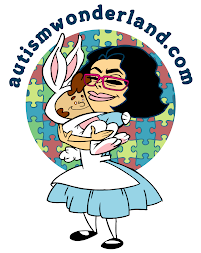 AutismWonderland: Through the Looking Glass: Rick Schostek - What Happens Next? Through the Looking Glass: Rick Schostek - What Happens Next? Our son Greg loves Sesame Street. The show’s characters are practically a part of our family. Greg has memorized countless skits and songs. He knows more Spanish words than his parents do, thanks to Luis, Maria, Rosita and the other characters on the show. Sesame Street’s lessons and lyrics are quite helpful for us. A couple of times a month, in response to a spilled drink or wrong turn, Greg or I will cite Big Bird’s tuneful advice: “Everyone Makes Mistakes.” Greg sometimes counts in the manner of Count von Count, adding “ah ah ah” when he’s finished. I’m sure there are many families who benefit from the teachings of the Children’s Television Workshop. I’m equally sure that our family is somewhat unique in our connection to Sesame Street. Greg is 23 years old. He has autism. In today’s terms, he’s “on the spectrum.” He’s one of millions of people who live with ASD, the incidence rate of which has increased dramatically throughout Greg’s lifetime. No one knows why. Better awareness and diagnostic tools account for some of the increase. That doesn’t explain everything though. Something else is going on. Recently ASD has received a lot of media attention, attributed to the increased incidence rate and the mysteries of the disorder. That’s all good. It’s meant more awareness, earlier diagnoses and increased research funding. The media attention is, however, 99 percent focused on children with autism. Greg isn’t the first young man or woman with ASD to transition into adulthood. With the increased incidence rate, he and others are at the leading edge of a wave of adults with ASD. In the last decade, our school systems faced a huge challenge with this growing population. The years have gone by and Greg has progressed, often with 2 steps forward and one back. Now he’s 24, holds a part time job, attends an adult day services program and is doing just fine. His transition to adulthood and the working world was the motivation for me to write the book What Happens Next? Raising a Son with Autism: A Father’s Story. As this wave of kids become adults, they’ll need a lot of attention from residential, vocational and other services. Is our adult services infrastructure ready for this wave? What happens next for Greg and these thousands of others? People with ASD have a lot to offer. They are some of the most interesting people walking this earth. They have many talents that can be put to good use in our society. Let’s get a realistic estimate of the resources required to support all children and adults with ASD. We need a comprehensive approach to support people with ASD. What happens next? I don’t know yet. But I know that those of us without autism must open our minds to a whole different world to help make this transition possible. I’ve always been uncomfortable with the notion that we’re fighting autism. We may be fighting to find the cause and cure, but not the condition itself. Autism isn’t a disease. It’s organic. It’s part of who Greg is. We haven’t fought autism all these years. We’ve adapted to it. In turn, we’ve helped Greg adapt to the confusing world he lives in. Now, maybe the world will also begin to adapt as our children grow up and transition into adulthood. Scripting? Sass Talk? Age Appropriate Response?